Benedict Cumberbatch recently took himself off the world's most eligible bachelor list, when he announced his engagement to theatre director and actress Sophie Hunter. 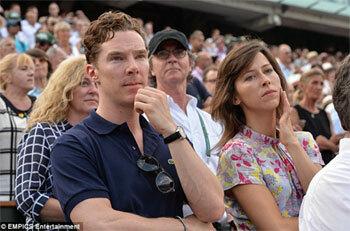 Cumberbatch and Hunter at the French Open earlier this year. The 38 year old star of Sherlock and his 36 year old fiancée first met about seven years ago when they were working on the 2009 film Burlesque Fairytales. At the time Cumberbatch was still in a relationship with his longtime girlfriend and college sweetheart, Olivia Poulet. The couple put an end to their decade long relationship in 2010, but have remained good friends. Cumberbatch then dated designer Anna Jones, but it was short lived and they broke up in 2012. At the time of their break up, Cumberbatch's older half sister revealed in a newspaper interview that her little brother was struggling to find a girlfriend who could match his intellectual capabilities. It seems that Cumberbatch is a lot like his Sherlock character in that he's quick-thinking and very well read. If that's indeed the case, it certainly seems he's met his intellectual match in Hunter, who graduated Oxford University with a degree in Modern Languages and went onto study at the Jacques Lecoq school of theatre in Paris. Although a trained actress (she once appeared in Midsomer Murders) Hunter is best known for her directing work. In 2010, for instance, she directed the Broadway revival of Ibsen's Ghosts and last year she directed the North American Tour of The Shackleton Project; an experimental play which dramatized the almost fatal voyage of the Antarctic explorer. In the show, Hunter chose to put her actors on stilts while they manipulated marionette puppets. In 2007, Hunter received the Samuel Beckett Award for writing and directing the play The Terrific Electric which was performed at London's Barbican Centre. As well as plays, Hunter has also directed a number of operas here and in Africa. She is also a talented pianist and singer. In fact, she once produced a recorded an album entirely in French! The announcement in The Times. Along with their shared intellects, Cumberbatch and Hunter also both hail from distinguished families. He being the great-grandson of Queen Victoria's consul general in Turkey, and his wife-to-be is the granddaughter of the late General Sir James Michael Gow, who in the 1950s was equerry to Prince Henry, Duke of Gloucester. 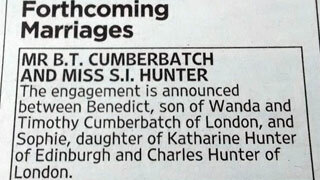 Despite Cumberbatch being an international celebrity, he has somehow managed to keep his romance with Hunter private. Even the announcement of their engagement was devoid of media fanfare. Instead, just a small notice appearing on page 57 of The Times newspaper under the listing of "forthcoming marriages". There's no word yet as to the date when the marriage will take place; hopefully it will be well before the next season of Sherlock, which isn't scheduled to be released until 2016! P.S. We haven't forgotten "part two" of Stephanie Cole! Her story continues next week.